I can't get over the fact his name is Mr. Brainwash. This is the persona adopted by the French immigrant at the heart of our story when he becomes a street artist in the third act. He sets up a show in this gigantic space and works the media so that he has thousands of people lined up waiting to get in, many of whom seem to be there solely on account of the hype, many of whom seem to have no idea of his work yet shout about his importance anyway. "Nobody's doing what he's done." What he's done? He hasn't done anything! You haven't been inside to see what he's done yet! So, someone's getting brainwashed. But who? Them? Us? Everyone? But there I went and got ahead of myself. Guetta meets more street artists - always, always with his camera running - including Shepard Fairey, on the verge of going big time via Obama's memorable "Hope" image. But there is one street artist whom Guetta yearns to film but who is so mysterious and unknowable it seems impossible. Ah, but is it? Fortuitously (? ), Fairey introduces Guetta to the one, the only Banksy, a faceless rock star in his native England and, thus, Guetta hooks up with Banksy who nearly instantaneously allows this blathering Frenchman into his seemingly rather private inner circle (?). Eventually Banksy suggests the best idea for his new partner in artful crime would be to take his massive amount of footage and create a film documenting the street art movement. One problem: Guetta not only has no idea how to make a movie but has labeled none of his cans of footage which are stored away in an unknowable pattern at his home. Nevertheless, Guetta manages to piece something together, something, seen in glimpses, that employs more demented quick cuts than a Michael Bay movie and makes even less sense. Distraught, Banksy decides to take over the film and, to do so, assigns Guetta back to L.A. to work on his own street art. And, thus, Guetta morphs into Mr. Brainwash, suggesting Joaquin Phoenix in "Gladiator" ("Conjure magic for them and they'll be distracted"), creating an overloaded version similar to Warhol - as several interviewees mention - that threatens to spin far, far out of control. Yet, it doesn't. It's a success. Definitively. Hugely. And so it seems this documentary the faceless Banksy has wound up making would be less about himself than about this Mr. Brainwash and how he has worked in an unassuming way to kind of trivialize their guerilla art and show how it, like everything else in our wonderful, wonderful world, is susceptible to commercialization. So....we come to the numerous accusations leveled that this is all a hoax perpetrated by Banksy and his peeps. Is it? Well, like a wise man once said, never trust a man who looks like the Nazgûl, which is to say that if Banksy tells me it's not a hoax, uh, well, sorry but I'm going to need some notarized documentation telling me it's not. If this is fiction then the holes in Guetta's story are actually kool in the gang. They don't matter because it's a perpetrated parable. If this is non fiction then those holes actually become more problematic. We are told Guetta runs a vintage clothing store that apparently funds globe trotting trips to document street artists and that when he turns into Mr. Brainwash he re-mortgages his business and essentially sacrifices all he's got for this one shot to make, uh, I don't know, photos of Elvis with a machine gun that look like something militia camps in Mississippi would sell as souvenirs. And all we get are about 17 seconds with Guetta's wife and no time with his kids? Where were they? How did they feel? 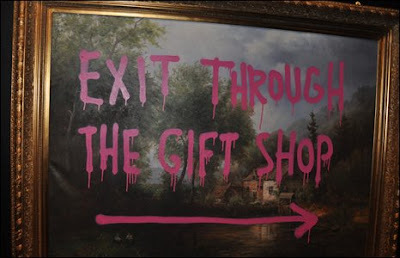 If "Exit Through The Gift Shop" isn't real then Banksy has managed to create a rough edged (kinda like street art, I guess) take on the rules of his game. If it is real and you were Banksy (or Fairey, or all the rest), seriously, wouldn't you want to lock Guetta in a pillory on Hollywood Boulevard? I don't really care whether it's real or not. It still raises the same questions: What separates commercial art from junk garbage? Here you have some untalented man coming up with random stuff, and those sells for thousands of dollars a piece overnight? You make an excellent point. It doesn't matter at all if it's real. I kind of wish I had seen it before I knew anything about it. I've heard so much about the "is it a hoax?" that I just couldn't shut off that part of my brain. Either way it is an interesting exposé of the artform. Was a strange documentary, but I enjoyed it. It IS strange. The narrative just feels so rough, like, well, a first time filmmaker. But you're right, in spite of that it's still enjoyable. That Bansky just has a skill for the arts. Like most I'm stil not entirely sure whether I think the film is fact or ficiton, but either way I liked it a lot. As Castor (and you yourself in your review) said, I think it raises some interesting questions about art and the commercialisation of art. I also really enjoyed the "inside" look at the cool and intriguing world of street-artists, and getting to see some of the best work the infant medium has to offer.